Storage units are an incredibly convenient option, allowing you to store your items for whatever time period you specify, whether it’s for the short-term or long-term. Leaving a few boxes of books or clothing in storage for a month or two while you transition into a new living space is one thing, but leaving items in storage for a year or more is quite another. Before you start packing up and loading things into your storage unit, it’s important to know what the difference is between short and long-term storage. Knowing what you need will help save you precious time, energy, and money. Storing your items for the short-term, which is generally three months or less, allows you to access your items quickly and easily. If you are storing things on a short-term basis, it’s a great idea to create an aisle in the middle of the storage unit so you can get in and out with ease. – Arrange your items against the wall to leave plenty of space to move boxes around, walk, or lift things. – Make sure your fragile items are packed well so they stay protected. Short-term storage items are generally moved around more often, making it especially important to secure any delicate pieces or boxes from the get-go, so they won’t shift or break. – Wrap them in bubble wrap, inflated wrapping, packaging peanuts, or kraft paper to help provide an extra level of cushioning. – If you’re storing furniture, it’s a good idea to drape a large cloth over the piece to avoid dust buildup. 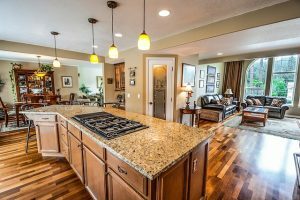 Perhaps you’re planning on building a home, you’re taking a long international trip, or you intend to upgrade to a larger apartment space in the next six months to a year. These are just some examples of why you may need a longer-term solution to keep your items safe until you’re ready to use them again. Long-term storage, which is generally anything more than three months, is a great option. – To ensure that no damage is done to your items being stored long-term, pack everything in durable boxes that can be stacked securely. – Avoid using plastic bags, as these can trap moisture in and cause mildew, or mold to build up. Many people choose to vacuum seal their clothing or other fabric items like curtains. – Storing appliances or electronics? Wrap cords carefully and ensure that they are covered with a large cloth or blanket. 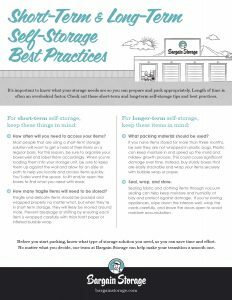 Whether you choose long-term or short-term storage, it’s important to label your items and keep inventory on what items are in storage. Knowing where items are located will save you the hassle of searching through multiple boxes to find what you need. So, which option is right for you? Determine how long you will need the storage space and what size unit is necessary. No matter what your specific needs are, we offer a wide variety of self-storage solutions. Let us help you store your belongings with ease! Talk to us about our affordable storage choices today. Learn more about our self-storage facilities in Texas and Arizona.